Anyone who knows anything about rugs knows what magnificent works of art they are. The colors, patterns, textures, and even materials used in weaving rugs are all carefully selected to elicit a response, whether that be emotional, tactile, or otherwise. 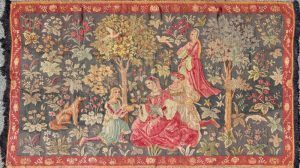 But these works of art become even more captivating in the form of tapestries, many of which depict pictorial scenes similar to what you might see in a painting or photograph. 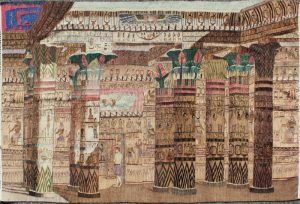 Here are some of our favorite pictorial tapestries from the Keivan Woven Arts collection. Read on for more information about their backgrounds and the scenes they depict. 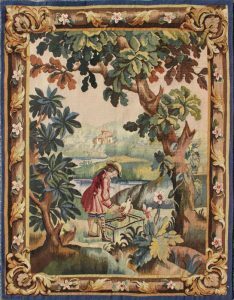 This antique tapestry was woven in France in the 1880s. 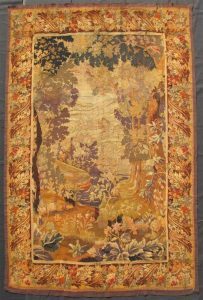 Like many French tapestries, it depicts a traditional woodland landscape. The entire scene is set within an abundant woodland setting of trees, bushes and various flora. Three figures, two men and a woman, are eating and drinking from a stream. It appears they have just killed a lamb or goat, and they are accompanied by a dog, snoozing soundly. 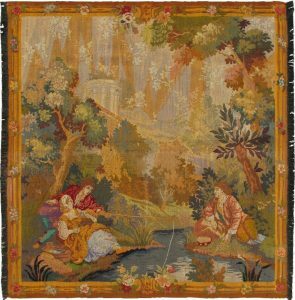 This enchanting antique Aubusson tapestry beautifully illustrates the remarkable sense of depth and richness that was perfected by French artisans of the 19th Century. Woven in the 1850s, it features a remarkable display of abundant vegetation and a multiplicity of flora. A wide variety of autumnal tones completely fill the patina body of this highly romantic landscape, depicting in its center a young boy and his bird. A storybook cottage can be seen in the distance, and the intricate border framing the field contributes to the romantic fairy tale aesthetic. 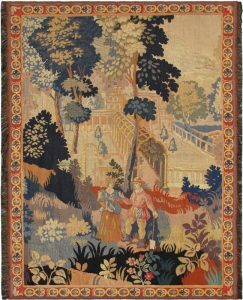 This French tapestry is quite old, dating back to the mid-18th Century, or the 1750’s to be exact. 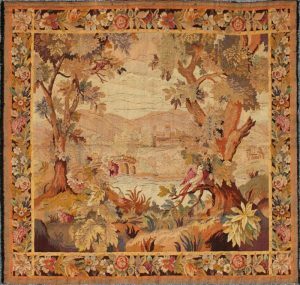 Like many French tapestries, it depicts abundant waterfront flora and rich tones of color. This particular tapestry, an animal perches over the calming stream. 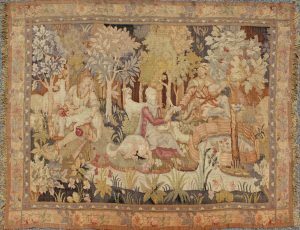 This square-shaped French Provincial tapestry was woven during the late 19th Century. Again, a waterfront landscape is depicted and framed by an expansive and richly decorative border of blooming flora. A young boy and girl play in the foreground, while a small village can be seen in the background. Another square-shaped tapestry, this was woven during the late 19th Century. Three figures, two women and a man, are resting alongside a stream in the forest. One of the women appears to be fishing, and they’ve brought a basket with them to carry their fish. A grand building can be seen in the background. 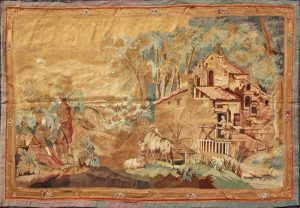 This antique French tapestry was woven in the late 19th Century and features a large mill house. A man and woman prepare to eat in the left-hand corner, while another man watches over them from the house. Two oxen nuzzle each other in the center. Of course, flora and fauna is abundant. Here, a vintage tapestry from the 1980’s composed of handwoven wool features a richly colorful landscape. A lone figure stands among various columns and facades bearing a complex network of symbols and motifs. The skillful artistry of the piece’s creator is evidenced through the light illuminating the lone figure and surrounding symbols, which stands in stark contrast to the shadows created in the spaces unaffected by sunlight. While the piece is dominated by a sand-colored background, the vibrant colors of the symbols and motifs include teal, rose pink, green, navy blue, and bright red. 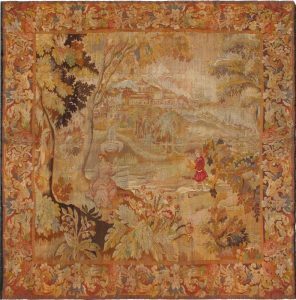 Woven in the 1890’s, this square-shaped tapestry features the vantage point of someone standing in a forest and looking out over the water to a small village nearby. A bridge leads from the forest to the village, and various hillsides stand starkly in the distance. A beautiful white bird with red wings in the foreground imbues the piece with levity and grace, while the piece de resistance is the exquisitely framed border of blooming and colorful decorative flowers. This delightful tapestry from the very early 20th Century depicts three women and a young girl. A dog accompanies them amidst trees, flowers, and birds in a wide array of colors. The charcoal-colored ground is framed by a deep red border of vining floral motifs. This tapestry was crafted circa 1910. Rich, deep colors depict a man and a woman who have just strolled through a lush garden on a private estate. They appear to be entering a forest filled with towering trees and colorful flora. The entire piece is framed by a design in which flowers are encased in circles of gold. 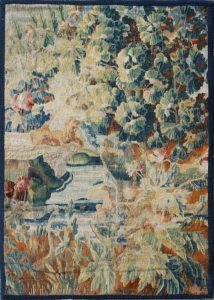 And finally, another lush landscape adorns this French tapestry from 1900. The deeply-toned flowers, bushes, trees, and branches coordinate well with an elaborately decorated border. A stream can be seen in the foreground, while various hillsides dominate the background. Leave your questions about our tapestries in the comments below. And click here to see more beautiful carpets on our website.